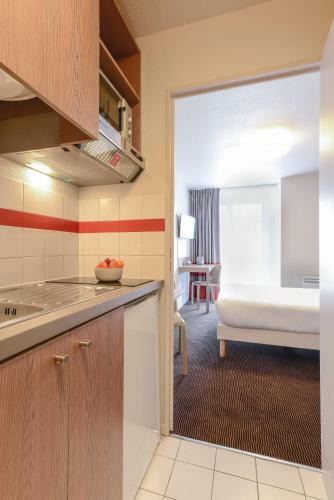 The Appart'City is located a 5-minute walk from the Cité des Sciences de La Villette and a 10-minute walk from the Zénith. All well-equipped apartments have a living room, desk area and satellite TV. Breakfast is composed of various breads, including gluten-free bread, pastries, fresh and hot beverages. Fresh fruit and fruit salad, as well as cheeses and yogurts are also provided. The Appart'City Paris is opposite Ourcq Metro Station which provides direct access to Gare du Nord Train Station, Gare de l'Est Train Station and Gare d'Austerlitz Train Station. This means Paris’s main attractions, including the famous Louvre, Montmartre and the Eiffel Tower, are all easily accessible. Les Docks de Paris Event Venue are 3.3 km away. For non-refundable bookings, guests will receive an email after completing their reservation with a link in order to make their payment online. For bookings of 7 nights or more, guests will receive an email after completing their reservation in order to have their credit card pre-authorised. Guests are required to show a photo identification and the credit card used for booking upon check-in. Please note that all Special Requests are subject to availability and additional charges may apply. For early arrivals before 15:00, an extra € 12 fee applies. End-of-stay cleaning is included for stays up to 3 nights. Weekly cleaning is included for stays up to 27 nights. Bi-weekly cleaning is included for stays of more than 28 nights. Additional cleaning is available at an extra cost. A damage deposit of € 250 is required on arrival. This will be collected by credit card. You should be reimbursed on check-out. Your deposit will be refunded in full via credit card, subject to an inspection of the property. This studio includes a private bathroom and a kitchenette. It features a view of the garden or of the interior courtyard. Rate: € 62.00 ... € 108.25; select dates below to get current rates. Rate: € 73.00 ... € 113.50; select dates below to get current rates. This studio includes a lounge area with a TV, a private bathroom and a kitchenette.